This chapter identifies confusion about the normative dimensions of sustainability as an important obstacle to teaching the ethics of sustainability across the curriculum. It aims to overcome this obstacle by presenting a framework of sustainability ethics consisting of principles derived from the most basic commitments of common morality. 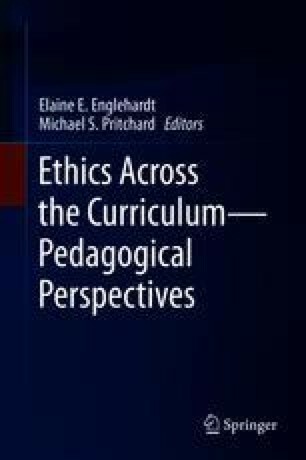 Four rationales and related models for teaching ethics across the curriculum are identified, and an argument for infusing education at all levels with education in sustainability and sustainability ethics is framed on this basis. The prescribed model involves cross-curricular integration and collaborative public service projects, where possible. Curren, R. (2014c). Meaning, motivation, and the good. Conference keynote and professorial inaugural lecture. London: Royal Institute of Philosophy, January 24, http://www.youtube.com/watch?v=rhjZvbvpJYQ&feature=youtu.be. IISD. (2013). The CERES principles. http://www.iisd.org/business/tools/principles_ceres.aspx. UNESCO. (2005). Education for sustainable development: United Nations Decade (2005–2014) website. http://en.unesco.org/themes/education-sustainable-development.